Valuetronics was an electronic stock which we alerted our EXCLUSIVE CLIENTS on just three weeks back. When valuetronics failed to hold above $0.785 we knew that it might be in trouble. 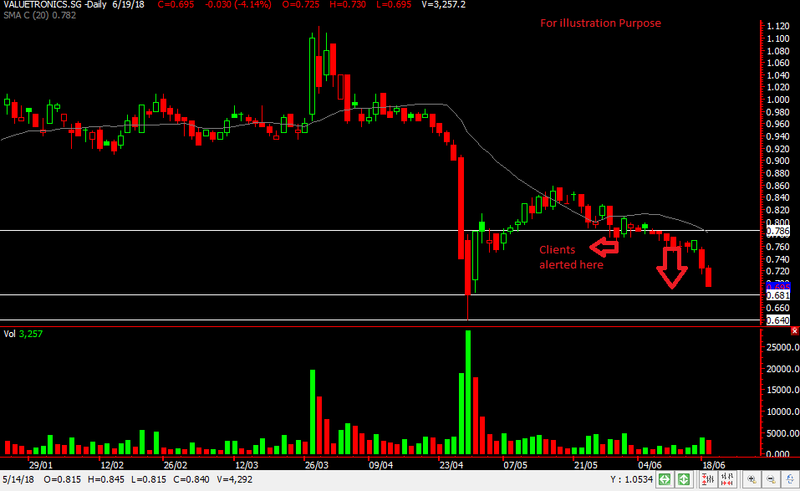 Furthermore, its peers were also being sold down hence that gave us more conviction in our shorting target. The moment it broke $0.785 we Alerted our EXCLUSIVE CLIENTS informing them about our trade analysis. We’re glad that valuetronics started to peel away although it tried to rebound but the overall sector remained weak and it couldn’t fight gravity. Where might our next target be? We’re looking at $0.68 then $0.64 where a rebound might happen. Let’s continue to monitor and see where this trade takes us. Don’t forget your trailing stops. 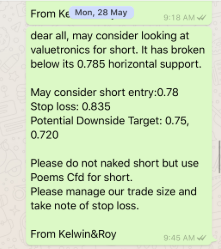 Want to be part of this EXCLUSIVE CLIENT list to receive such timely trade analysis? Wait no longer and be a Client of Kelwin&Roy to join their vibrant community of traders.